JD (S) Chief HD Kumaraswamy has been elected as the legislative party leader. While addressing media after the meeting, He accused BJP of trying to lure his party Legislators with Cabinet Berths and Rs 100 crore to each one of them to form the Government. 'BJP is using Black Money to buy MLAs. Central Agencies have been threatening our MLAs. BJP is greedy for power but we won't let them have the last laugh,' he said. 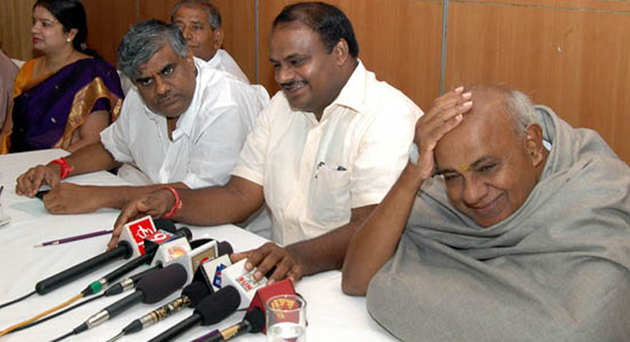 Kumaraswamy opined split of Secular Votes between Congress and JD (S) benefitted BJP in the Assembly Polls. He made it clear Narendra Modi can't claim credit for BJP emerging as the single largest party. JD (S) Head pledged not to allow BJP form the Government in Karnataka. He is confident of establishing a stable government with the support of Congress Party. Kumaraswamy rubbished the reports of Javadekar and other BJP Leaders holding talks with him. He warned BJP to stop Operation Kamala by saying, 'If you take one of our Leaders, We would take two of your Leaders. Whoever oppose BJP are most welcomed into JD (S)'. A day after BS Yeddyurappa claimed he have the support of Deve Gowda's Son (Revanna) and 12 JD (S) MLAs, Revanna appeared before Media along with Kumaraswamy to declare they are family and there won't be split in JD (S).